Extruded styro- foam without visible pores. 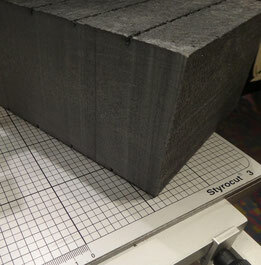 Density is even higher than of all other extruded styro- foam. Propellant R134a remains for a long time in the inner, is ozone-friendly. Propellant Ethanole will go out within several month. When cutting with blower-cooled wire, the wire will only reach melting temperature inside the workpiece. Therefore cutting with a Styrocut is nearly odorless and non-irritant. For your information: Our supplier has informed us that HD300 foam is no longer available in DOW blue, but only in the color anthracite. For additional needs in blue please ask us for remaining stock.